Funding will transform Soundbridge Seattle Symphony Music Discovery Center into a nexus for education, live music and technology. 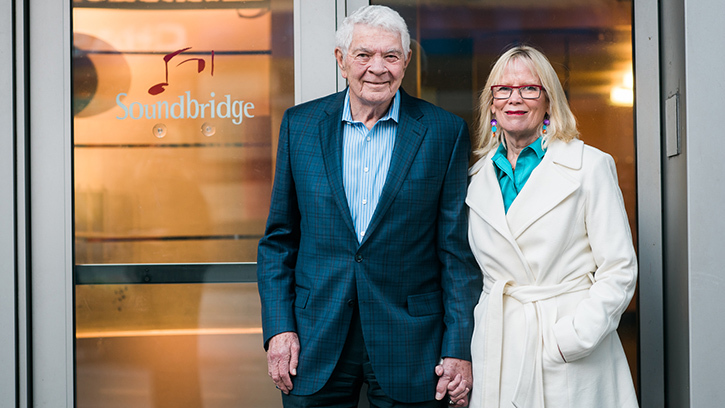 Today the Seattle Symphony and Seattle philanthropists James and Sherry Raisbeck announced the $2 million Raisbeck Matching Challenge to transform Soundbridge Seattle Symphony Music Discovery Center from an education and workshop space to a new tech-enabled performance venue for the future. Soundbridge, a 2,000-square-foot space at the corner of Second Avenue and Union Street in Benaroya Hall, was opened in 2001 as the Symphony’s hands-on music education and exhibit space. It currently serves 9,000 children and 4,000 adults annually. The space will be transformed acoustically and visually, creating opportunities for the Symphony to serve the community with an even broader range of programs including unique live performances, education and community projects, and distance learning. The newly redesigned space will have state-of-the-art sound and lighting capabilities as well as flexible seating for many different types of performances and events. The space will be built with distance learning in mind, as well as infrastructure and a fund for future technological upgrades. The new venue will continue to accommodate many of the community events currently taking place in Soundbridge, including Sensory Friendly Concerts and the Merriman Family Young Composers Workshop. Visually, the space will go from a family-centered design to a space that reflects the design of the other interior spaces in Benaroya Hall, accommodating audiences of all ages. Other physical changes in addition to removal of interior walls and raising the ceiling height include enhancements to the entry to accommodate ticketing, and food and beverage capabilities. The space is being designed by LMN Architects, the original architects for Benaroya Hall. The project budget including design, construction, technology for future upgrades and funds to support education, community and audience engagement activities is $7 million, of which $5 million has been raised. Once the remaining $2 million is raised through the Raisbeck Matching Challenge, the project will be fully funded. Soundbridge will remain open until fall 2017 when construction begins, and the space will re-open in early 2018. James and Sherry Raisbeck are generously matching every dollar contributed to the Soundbridge renovation project, up to $2 million. Your gift will be doubled by the Raisbecks, helping the Symphony raise crucial funding to begin the renovation and fund future programs. You will be part of the future of Soundbridge, helping your Symphony serve more people in this community, in more creative ways than ever before. To learn more about opportunities to support this project, please contact Major Gift Officer Maria Kolby-Wolfe at maria.kolbywolfe@seattlesymphony.org or 206.215.4737.